Baltimore Heritage members should discover a bit of preservation news in their mailbox this week as we just sent out a late summer edition of our Baltimore Heritage newsletter. A few of our features may be familiar to readers of this blog, including our piece on John Pente and an update on the Hebrew Orphan Asylum, but the newsletter also includes previews for upcoming events, a list of this year’s Preservation Award winners, and an advocacy update on a threatened building in Ridgely’s Delight. With a fresh visual design and a new format, we welcome any questions or comments on the issue. 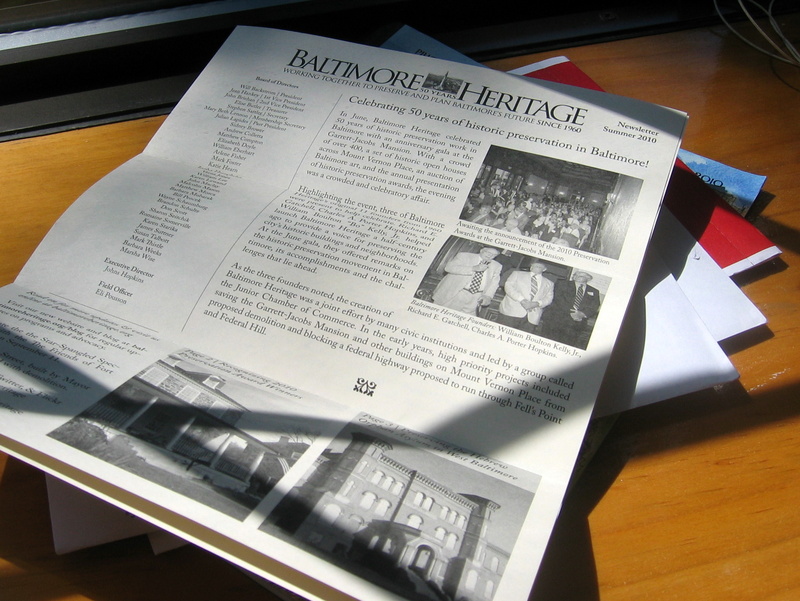 You too can receive a copy of the Summer 2010 Baltimore Heritage newsletter by becoming a member of Baltimore Heritage today! Individual memberships start at only $35 (less than $3 a month!) and include discounts on all of our Behind the Scenes tours and first chance at registration for our popular Baltimore by Foot spring walking tour series. Read up on the membership benefits at each level of support and consider becoming a member or renewing your support for historic preservation in Baltimore.